Add timeless luxury and sumptuous comfort to your home with this pure sheepskin neutral toned rug from Royal Dream. The rug’s plush softness makes it perfect for running on your favourite sofa, draped over your lounge chairs, or for lying in front of the fire in a fleecy wonderland. The rug is free from any chemical smells and is presented in a unique gently curving shape. Please Note: This is a natural product, therefore size may vary between 110cm-120cm in length and 60cm - 80cm in width. Please leave the sheepskin rug to air for 24-48 hours when opening to release the natural sheepskin smells. Bought for a friend as a gift and she LOVES it! The material is so soft, and well packaged too! Would certainly buy another! Very pleased with this rug. Good quality and colour. I ordered one of these rugs which was perfect. Colour and size was great and no smell of sheep. Unfortunately the second one I ordered smelled so bad I couldn't keep out in the house. I put it out on the washing line to air and it got moist and a little dirty, and still it smells so bad. Now I have a rug that can't be used or returned. Didn't know what to expect as have had other sheepskin rugs. It is lovely and soft and silky. It's so nice my granddaughter wanted it in her bedroom. So now have ordered more for my bedroom. Received two of these today to replace two old ones in our bedroom, Yes!they are not identical!! but you don't often get identical sheep... What they are though are beautifully soft and luxurious looking sheepskins worth far more than I paid for them..so much so that I have ordered a pink one for our granddaughters room. very very happy with my purchase. 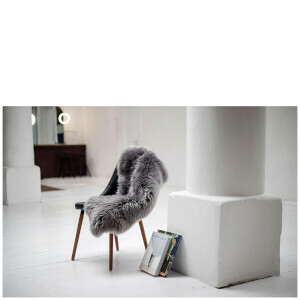 This sheepskin is absolutely beautiful so so soft and natural on your feet, you don’t won’t to take your feet off, Soothing and relaxing after being on your feet all day long. Fantastic service, highly recommend and the best at the best price. Amazing quality product for the price ,luxuriously soft a nice size aswell smell isn’t to bad, and very impressed with delivery very efficient and quick!